Kaduna state governor, Malam Nasir El-Rufai has made the 2016 Independence Day celebration another to remember for three convicts who were granted amnesty and were released. Malam El-Rufai announced the pardons in his address to the residents of Kaduna State to mark the country’s 56th Independence anniversary. This follows recommendations from the Advisory Council on the Prerogative of Mercy. The convicts who were pardoned are: Mohammed Usman, Hassan Saidu and Zaro Dickson. Usman and Saidu were left off on account of being over 60, good conduct and having only a little part of their sentence remaining. Serious ill-health accounts for the pardon given to Zaro Dickson who has hypertension and diabetes. Malam El-Rufai urged Nigerians to be confident that our country will overcome the current economic challenges. He asked residents of Kaduna to continue to uphold peace and harmony, and to shun any recourse to self-help and vendetta. To mark independence day, the Kaduna Golf Club staged the Governor’s Cup. Wife of the Governor, Mrs. Hadiza El-Rufai, performed the tee-off at the event which attracted golfers from across the country. Gambo Hamza Garba, Executive Secretary of the Kaduna Investment Promotion Agency (KADIPA), said that the golf event was organised to showcase Kaduna’s investment and tourism potentials. Mrs. Hadiza El-Rufai also hosted an independence party for children. 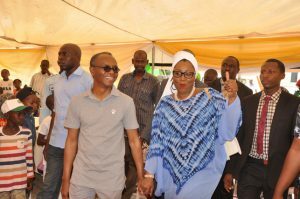 Staged within the grounds of the Government House, the party was attended by Malam Nasir El-Rufai, Mrs. Ladi Bala, wife of Deputy Governor Barnabas Yusuf Bala and Hajia Rabi Abdusalam, the Commissioner for Women Affairs and Social Development.